Like every 90s geeky kid, I’ve played Magic: The Gathering in high school; I’ve stopped playing in the early 2000s and parted with most of the cards I had but I still kept one deck which features cards from Beta to Visions. I’ve always been told that as entertaining as a red/white deck could be, the weak color combination would make it so this type of deck could never rival the ones with more complimentary colors. 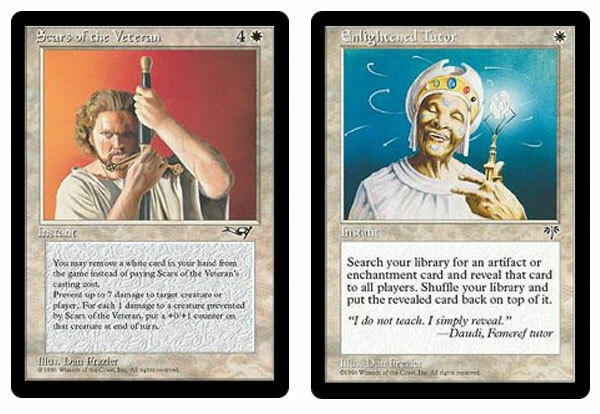 When I started crafting my deck I did struggle with the two colors working side by side but never reaching a symbiosis until I discovered how two completely unrelated and obscure enchantments could make a red/white combo tremendously potent when complementing each other towards the same goal. The cornerstone of my deck is to discard lands to deal damage. To do that the cards are meant to sustain the enchantments providing a steady stream of lands to discard while being proficient in their own rights. This is a fast deck meant to remove the player from the game as soon as possible without paying attention to the small creatures summoned during early turns. 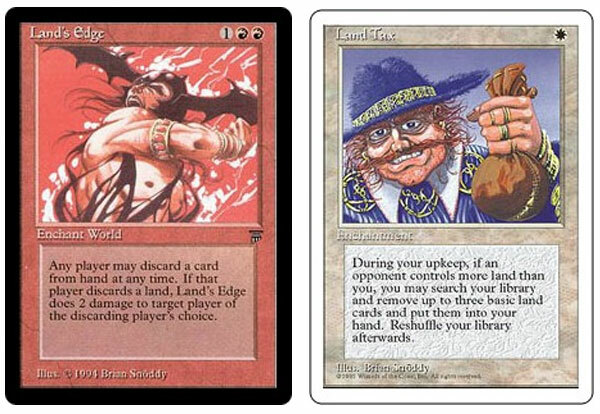 Land’s Edge – It’s a double-edged sword: any player can discard a land to deal 2 damage. A very mighty enchantment for a player with a lot of lands to discard. Land Tax – With this enchantment and a deck built for a low land count, I’m guaranteed to deal at least 6 damage during my upkeep. The way lands are used on my deck is quite unusual as the function of basic lands isn’t to produce mana but instead do everything they are not expected to do such as deal damage or give life points. This is the reason why I have a very select number of special lands which provide versatility when it comes to color or a high number of colorless mana. Plateau – The simplest and easiest way to get a red or white mana with no strings attached. 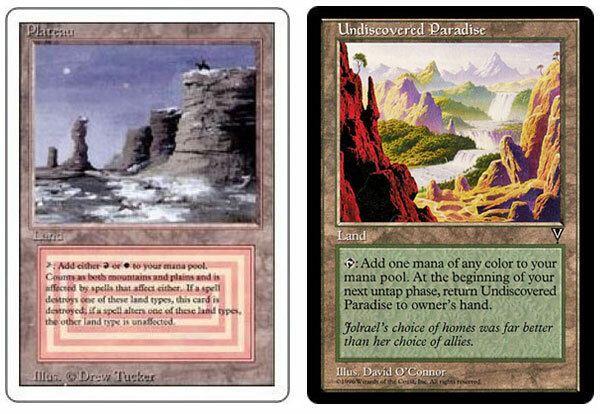 Undiscovered Paradise – An easy way to get a color mana of my choice quickly and a land to discard to do damage. Urza’s Mine, Tower, and Power Plant – Alone each of these lands are ok but together and with a deck using a lot of X cards, it’s an easy 7 colorless mana. Depending on my opponent’s deck, I do not always play with the Urzatron in mine nevertheless it’s one of the best land dynamic when playing with a library containing a high number of cards with X in their invocation cost. As a side note, I’m quite happy to have a complete set featuring all the illustration variations of the cards. Unsurprisingly the red cards in my deck are there to deal damage, a lot of it! As this isn’t a creature deck, the red ones present in it are almost used as instants: they appear, strike, and vanish in the same turn. True to the philosophy of the deck, the fiery cards all have a low invocation cost when it comes to colored mana which helps me maintain a low number of land on the field while offering multi-faceted use. Fork – One of the most versatile red card I’ve seen: clone or copy any spell you want. 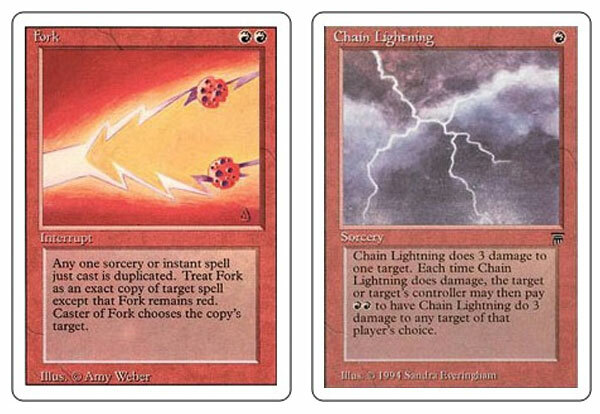 Chain Lightning – Everything I love about Lightning and Fork in one card. Lava Burst – Of the X red spells; it’s my favorite has creatures cannot avoid its damage. Lightning – Not much to say about this card; it’s the quintessential red spell. Fireblast – I can sacrifice two mountains to do lot of damage and make sure my land count remains low. Shivan Dragon – A very strong upgradable flying creature with a pretty good invocation cost. Ball Lightning – One of the most fun creature in my deck; it’s powerful and it’s fast. Viashino Sandstalker – An interesting creature that comes and go but can be very efficient. When you don’t get mana from lands, you ought to get it another way; this is why a fair number of artifacts in my deck serve that purpose while the remaining ones either help making my killer combo sustainable or disrupt my opponent’s strategy. Mox Ruby – A great way to get red mana without a land. 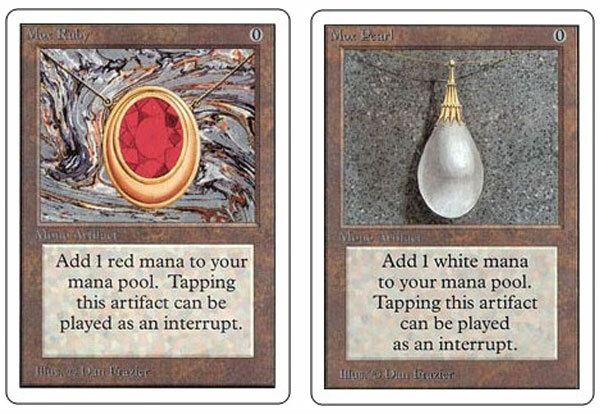 Mox Pearl – Same as the Mox Ruby for white mana. Sol Ring – A great card to get colorless mana. It’s an integral part of my strategy to use mana sources that are not lands. Zuran Orb – Helps me gain life points while making sure I have less lands than my opponent. Jester’s Cap – Nothing’s more fun to taking a look at your opponent’s deck and removing the most dangerous cards. White cards are used as the polar opposite of the red ones; every single card of that color in the deck is here to prevent damages, even the creatures. Again the vast majority of these cards offers a tiny invocation cost coupled with a tremendously efficient effect. As the deck isn’t designed for a lengthy creatures against creatures confrontation, suffering damages cannot be avoided therefore making sure there are enough spells preventing them is required. Scars of the Veteran – What it does is tremendous and being able to discard something to pay for its invocation cost is simply awesome. Enlightened Tutor – When your killer combo enchantments are coming soon enough, this is the card you hope to get. Holy Day – Great against decks with a ton of small creatures. Healing Salve – A basic necessity for any white deck. Remedy – One of the most versatile healing spells out there. Serra Angel – A valuable creature that can attack without being tapped. Femeref Healer– A quick way to prevent damage. White Knight – A very simple yet efficient creature. The core deck is quite small in essence: 4 sets of 35 different cards plus an abundance of basic lands; and if you are wondering if you’ve read this correctly… yes, I just implied that the number of Moxes in my deck is 8. But bare in mind that I started playing before Unlimited came out and, if you pardon my pun, as rare as Moxes were, it wasn’t uncommon to have friends, or friends of friends, who had one; not to mention that back then, small cities or stores tournaments often offered them as prizes. The cards that aren’t core to the deck are there to help me calibrate and optimize it based on what type of deck my opponent is using. Here’s a basic summary of the 200 cards that can compose my deck which on average is around 80: 48 red cards, 36 white ones, 4 multi-colored oddities, 28 artifacts which tally to 36 instants, 24 creatures, 20 sorceries, and of course 8 enchantments. When it comes to lands, it boasts: 12 special ones, another 12 composing the Urzatron, 26 plains, 4 snow-covered ones, 26 mountains, and 4 snow-covered ones. Energy Bolt – This card embodies the duality of a red/white deck: inflict damage or gain life points. Howling Mine – If my opponent deck is slow, I’m going to make sure to speed up the game but if my opponent uses a fast deck, these cards won’t be in mine. Lotus Petal – Despite being a cheap Black Lotus imitation, this artifact is still very useful in a deck like mine. Fireball – It’s efficient on either a strong single target or a multitude of little ones; combining with Fork can be effective. Disintegrate – Another red spell with X as an invocation cost; I saw it’s efficiency diminish over the years. Incinerate – The perks of Disintegrate at a low invocation cost; it’s a practical substitute to Lightning. City of Brass – A quite useful land that I always keep nearby for the times when I do not play with X cards. Plains – The default white mana land card; I have an usually high number of lands due to how they are used in my deck. Mountains – The red mana equivalent of plains; the basic lands I have range from Beta to Visions including a few snow-covered Ice Age ones. Reasons Why The Third Console In My Living Room Isn’t a Nintendo Wii ... Having Fun With Lego Bricks!